As it happens, I do think coyotes are cute–even beautiful–with their bushy tails, large alert ears, thick pelts and fearless strides. There aren’t many predators you will find scoping out the offerings on Canada’s busiest highway, in full view of thousands of humans. It also has a terrible reputation, thanks largely to its habit of preying on livestock animals, and cemented in popular imagination with Wile E. Coyote’s relentless and bumbling pursuit of the Roadrunner; but this has shifted somewhat in recent years with farmers’ recognition of the role coyotes play in rodent and pest control. Coyotes, along with squirrels, raccoons and rodents, have benefited enormously from human development of North America: they are one of the few species whose range is expanding. As an animal of edge habitats (where, say, field meets forest, or forest meets stream), the fragmentation of Canada’s vast forests proved a bonanza. That, along with the elimination of wolves from much of the continent (who are among coyotes’ top competitors for prey) may explain why I found one so comfortably strolling through the urban heart of the province. 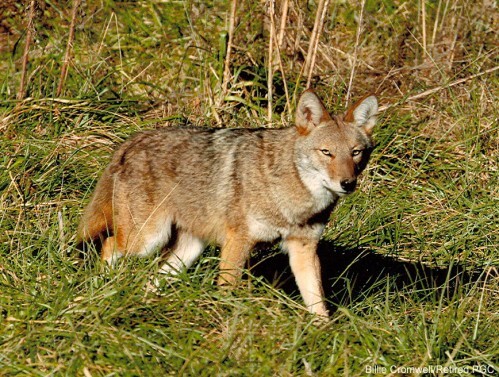 Coyotes are smart, bold, persistent predators who use their signature calls to communicate with each other and who like to play; they’ve got more in common with Fido than you might want to know. Many previously despised wildlife species are enjoying a resurgence of respect today, probably because, in the midst of the sixth great extinction event on earth and one caused entirely by human activity, it is becoming so rare and so removed from our daily experience. So coyotes aren’t alone in having escaped from the ranks of “vicious pest,” but their rise to the status of “culture hero” may be unique. Coyote-the-Trickster, a god of the first nations similar to Scandinavia’s Loki or the Pan of the ancient world, is an enormously popular character in urban fantasy, and since fantasy itself is one of our time’s most popular genres you might be more familiar with his fantastic rather than his environmental incarnations. (See Charles de Lint’s Someplace to be Flying for a Canadian example–or just read it because it’s a good book.) Even Wile E. Coyote is argued to be a manifestation of the old Trickster myth in spoof form. Poor Coyote, destined to be a blank form on which humans project whatever they want whether good or bad. Trickster God to vicious pest to literary icon with barely a rest at mammal in between. We have coyote packs that we can hear from the house when they hunt. Specially fun in late summer when the pack is teaching the cubs to hunt and you can hear the young ones’ shrill soprano among the more mellow altos of the adults. Sometimes the most enthusiastic soprano trill will end in a yelp and it is fun to anthromorphise why…tripped over his clumsy adolescent feet, got nipped by an adult for too much unregulated enthusiasm? Then the soprano starts up again, unvanquished. Lovely.